I ran across this recipe a while back and printed it out so I could try it sometime. That time came today. And boy am I glad I tried it. This cake is delicious! This is my take on the recipe - a little lighter on the butter and sugar and if you want to try whole wheat flour for half of the white flour, let me know how it turns out for you. I was being lazy and didn't do that this time. It's pretty easy, too. Mine isn't quite as swirly and pretty, but I was being lazy and trying to keep it to a one-bowl-one-pan-one-spatula recipe because I hate doing dishes. And I'm in love with bundt pans at the moment. And cake. Heat oven to 350°. Grease a bundt pan and set aside. Cream butter and sugar. Add almond extract, baking powder, and salt. Beat until creamy. Scrape down the sides a couple of times to make sure everything is well mixed. Add eggs. Beat until incorporated. Scrape down the sides. Add the milk. Beat until very smooth. Stir in the flour. Beat until smooth. Pour half the batter into the prepared bundt pan. To the rest of the batter, add the cocoa, rum flavoring, and extra milk. Stir until mixed. Pour the chocolate batter over the almond batter in the pan. Run the spatula through the batter a couple of times to give it the swirl effect. 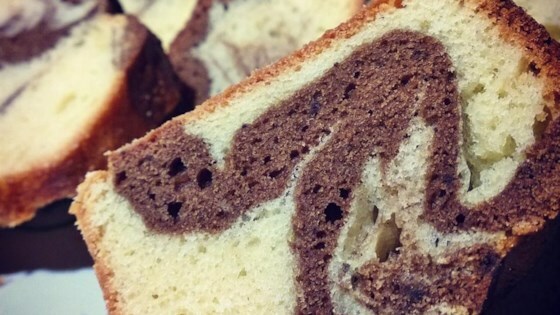 Don't overmix, you want swirls, not a light chocolate cake. Bake for about 60 minutes, until a toothpick comes out clean. Let the cake cool 5-10 minutes in the pan, then turn out onto a fancy plate. Let it finish cooling. Or eat it warm. It's so tasty it doesn't need frosting. 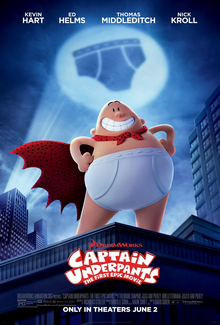 So here's the review: Captain Underpants is an awesome romantic comedy. It dawned on me partway through the movie that they were following the basic storyboard for a romcom. Completely. Including the cheesy musical montage number about a third of the way through. It was awesome. The story is told, and partially illustrated, by the two main characters, George and Harold, mischievous grade-schoolers who adore a good prank. They have a great romance going - bff's forever. The villain, sort of, is Principal Krupp, who is determined to subjugate them and crush all joy from the kids at the school. He also has a shot at romance with Edna the Lunch Lady. Things get a lot more complicated. Yes, it involves a superhero wearing just his underwear and a cape. But Captain Underpants is awesome. It involves giant robotic toilets. And lots and lots of gags that third-grade boys find hilarious. I know, I work with a whole bunch of them in Cub Scouts. But the movie rises above the potty humor. It never reaches the point where I just want it to stop. They keep it light. The story is actually a pretty good story. The animation is beautifully done. Overall, this was one fun romp of a movie. Four stars, with some mild violence and a few Poopypants jokes.